This October will be very special here at Horror Delve. I’ll be posting my Third Annual Halloween Reading List shortly. Later in the month will bring a list of suggested movies designed to send a shiver up your spine. There will be a bit about my visit to Halloween Horror Nights at Universal Studios, Orlando, and a possible surprise or two along the way. This will all lead to a grand finale when I will post my interview with a legend in the horror field, a man who’s won an endless string of prestigious awards, including multiple World Fantasy, British Fantasy and Bram Stoker Awards over his 50+ years of writing. 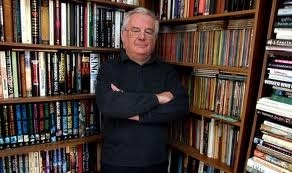 I personally consider him the greatest writer ever – Ramsey Campbell. It’s going to be a great Halloween season here at Horror Delve! It will. Getting to interview Ramsey is exciting for me.